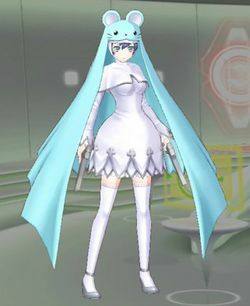 A Digimon wearing a veil modeled after a mouse, it is Sistermon Blanc's elder sister as well as the twin sister of Noir. Instead of travelling together with Noir and Blanc, it roams around the Digital World investigating unusual phenomena and reports its findings to Gankoomon. Despite its gentle personality, it is strong-willed and popular with the Digimon residing in the places it visits. While it is friendly and leads a peaceful life by day, by night it turns into an assassin who hunts down any troublemakers it receives word of. It has a cherished sword named Shirotsume-Ichimonji, and its Signature Move is cutting down the enemy without making a sound (Shirotsume-Ichimonji-giri). Not only that, it also utilizes various assassination techniques such as rapid-throwing the two knives it hides within its sleeves (Byakusai), and luring the enemy in until they let their guard down, then stabbing them in their vitals at close range using the knives planted on its feet (Tohhou). 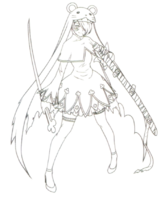 A Digimon clad in a hood shaped like a mouse's head, it is the older sister of Sistermon Blanc and the twin sister of Sistermon Noir. Unlike its sisters, it wanders the Digital World investigating abnormalities and reporting what it finds to Gankoomon. Its calm and gentle demeanor belies an unparallel mental fortitude, making it a favourite among the other Digimon that happen to meet it. It carries guns called "T" in each hand, unleashing them in the silent but deadly special move "Silent Bullet", and in the rapid-fire straight line special move "Fury Fire". One of the three Sistermon sisters, it wears a veil modeled after a mouse. It roams around various lands investigating unusual phenomena, and reports its findings to Gankoomon. It leads a peaceful life by day, but turns into an assassin who hunts down troublemakers by night. Its Signature Move, Shirotsume Ichimonji-giri, is using its cherished sword Shirotsume-Ichimonji to cut the enemy without making a sound. Refers to the title given to those who join a sisterhood of nuns. 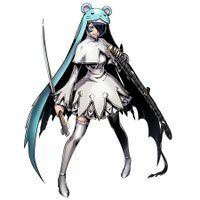 Sistermon Ciel was originally created as a redesign of Sistermon Noir due to religious sensitivities, designed with a sky-blue and white uniform instead of Noir's black to distinguish it from the traditional uniform of a catholic nun, but is considered a separate species. Sistermon Ciel is similar in design to Sistermon Noir, but has longer, smoother hair, with its left bang covering its eye, and it carries a white-and-gold sword, which has a black sheath. The eyes on Ciel's Klobuk are animate and change based on Ciel's emotions, giving Ciel two sets of eyes. 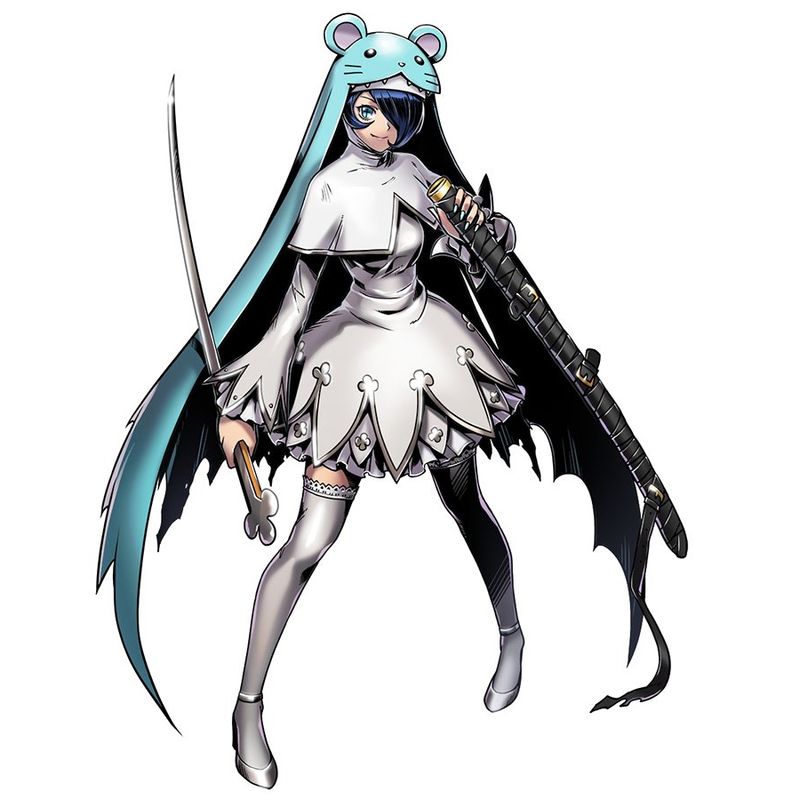 In Digimon Story: Cyber Sleuth Hacker's Memory, it has Sistermon Noir's hairstyle and T guns, but its klobuk is sky-blue with mouse ears instead of black with cat ears, it has navy blue hair in place of Noel's silver hair, and its habit is white instead of black. However, its dot sprite retains Noir's cat ears. Shirotsume Ichimonji-giri  White Clover Horizontal Slash 白詰一文字切り N/A Cuts down the enemy without making a sound by using its cherished sword Shirotsume-Ichimonji. Byakusai  White Murder 白殺 N/A Rapidly throws the two knives it hides within its sleeves. Tohhō  Piercing Wasp 突蜂 N/A Stabs the enemies at close range using the knives planted on its feet after letting their guard down. N/A N/A Rapidly fires bullets from both T guns at random directions. N/A N/A Rapidly fires bullets from both T guns in a straight line. Sistermon Noir is not available in American versions of the game, instead - Noir was censored and replaced with Ciel. Sistermon Ciel is #335 and is a Light Virus type Adult level Digimon who uses 6 memory. Its special attacks are Silent Bullet (A renamed Mickey Bullet) and Fury Fire (A renamed Bless Fire). Its support skill is Supervisor which increases experience in battle and lowers the damage taken by 5%. 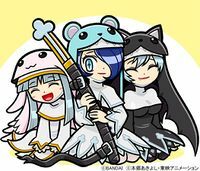 Ciel can evolve from Sistermon Blanc, Lunamon, and Dracumon and can digivolve to Lady Devimon, Pandamon and Sistermon Ciel (Awaken). Sistermon Ciel evolves from Sistermon Blanc and Dracomon X-Antibody and can digivolve to Megalo Growmon X-Antibody, Cho·Hakkaimon, and Lilimon X-Antibody. ↑ This attack belongs to Sistermon Noir in Digimon Story: Cyber Sleuth Hacker's Memory, taught to her by Gankoomon. This page was last modified on 17 April 2019, at 05:40.